Wow, it’s November! It seems like it was just yesterday that I was complaining about summer ending. And now we’re smack-dab in the middle of fall. Fall! When everything is pumpkin flavored! Fall! When The Real Housewives of Atlanta is back on TV! Fall! When sweet potatoes are plentiful! Then while I was editing the photos for this post, I realized: oh, I did sweet potato gnocchi last week. I did do a sweet potato recipe this season. Oops. I guess since it was pasta, somehow it didn’t feel like a sweet potato recipe. Or something. But that’s okay, right? Because we can all use easy side dish ideas and that’s exactly what this Apple Cider Glazed Sweet Potatoes recipe is–easy! The potatoes are roasted in the oven until they’re tender and then glazed with an apple cider reduction. Simple! 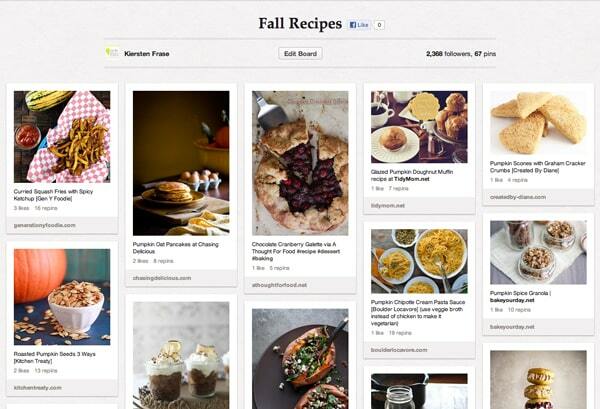 Back on the subject of fall, are you following my Fall Recipes board on Pinterest? I’m collecting all kinds of tasty fall foods there. 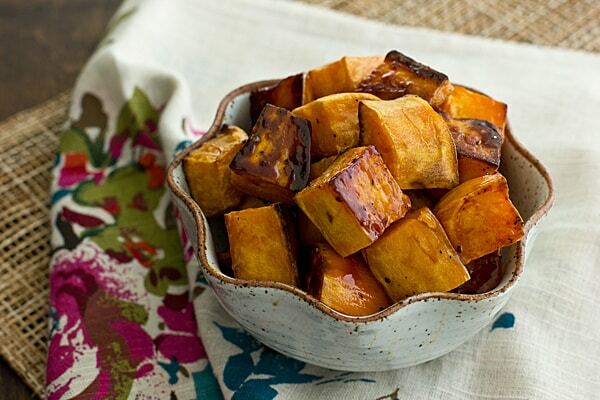 Oven-roasted sweet potatoes glazed with an apple cider reduction. Toss sweet potatoes with oil on a rimmed baking sheet. Season with salt and pepper. Bake 25 minutes, stirring halfway through cooking time. While potatoes are roasting, heat apple cider in a small saucepan over high heat. Bring to a boil and cook until reduced to about 2 tablespoons, about 12 minutes. 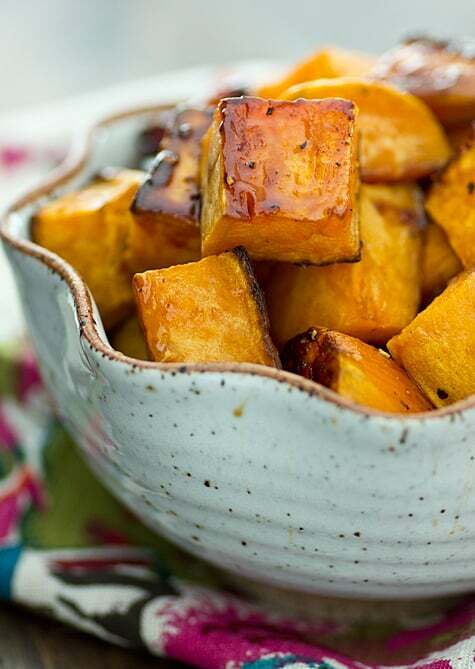 Drizzle sweet potatoes with apple cider reduction; toss to coat. Bake 5 minutes more. I love how simple this recipe is and apples sound like they would go perfectly with sweet potatoes. I love apple cider like nobody’s business. Seriously, I could chug a jug a day if my conscience would let me. And I really like sweet potatoes so I’ll have to make this soon. We have a big jug in the fridge right now. Think I might throw a cinnamon stick in a saucepan and heat some up tonight. I love sweet potatoes, and these look delicious. I love the glaze. I happen to have all of the ingredients on hand, so this recipe is happening this weekend. I love this as an alternative to the marshmallow mess of my youth! I love sweet potatoes in any way shape or form! But I also love that bowl… who makes it? I have made these several times and have a batch in the oven right now. This is by far my new favorite way to eat sweet potatoes! My husband likes things sweet so I add some brown sugar to the cider before reducing, and it’s fantastic. Thank you for this tasty and simple dish! My mom made a glazed sweet potato that I remember as the best ever and it had a ham glaze; I would love to eat that again! I wasn’t into cooking so never learned her receipies. Hey Eunice, we’ve only tested this recipe with spiced cider. There’s no need for brown sugar since the cider is already sweet, and when you make the reduction it thickens nicely. would this work with winter squashes too? why not… going to try I think…. I think it would work well with winter squash too! These look amazing. Can they be made in advance like two days? I’ve never tried making them in advance, so I can’t say for sure. I have local apple cider….what do I add to make it spiced? You could add mulling spices to it or find a recipe for spiced apple cider. The local apple cider that I buy is already spiced, so I’ve never had to add the spices myself. Thank you so much for this amazing looking recipe! I love healthy recipes and I will look forward to trying it out and sharing it with my followers. As Arnold says “I’ll be back” 🙂 Thanks again! I just made these for our Thanksgiving dinner. I couldn’t find spiced apple cider so I used the regular kind. I add cinnamon and apple pie spice — a dash of each. They were delicious! Thanks for sharing!